This is Part 8 of our New York Food Adventures! Check out the rest here! Wendy: Hi guys! I’m extremely excited to have AngryRussian write his first guest post for Eat ‘n About! He will be doing a series on New York pizza so here it is! New Yorkers are known to be extremely passionate about their pizza, so it was a given that we would have to try a few “pies” while in the Big Apple. But how would we choose which ones to try? Luckily for Wendy I had recently become obsessed with the “One Bite” pizza reviews posted on Dave Portnoy’s Instagram and the accompanying One Bite Pizza App. He reviews a slice at a different Manhattan pizza joint every day in a short hilarious video, often with celebrity guest reviewers. The app allows you to search by location or by map to find pizza places near you. You can view Dave’s video reviews, reviews from other users and even upload your own ratings and videos. Long story short, I used it several times while in NYC to search for well-reviewed places around wherever we were at the time, and because of this Wendy insisted I also contribute to the blog with my first post! 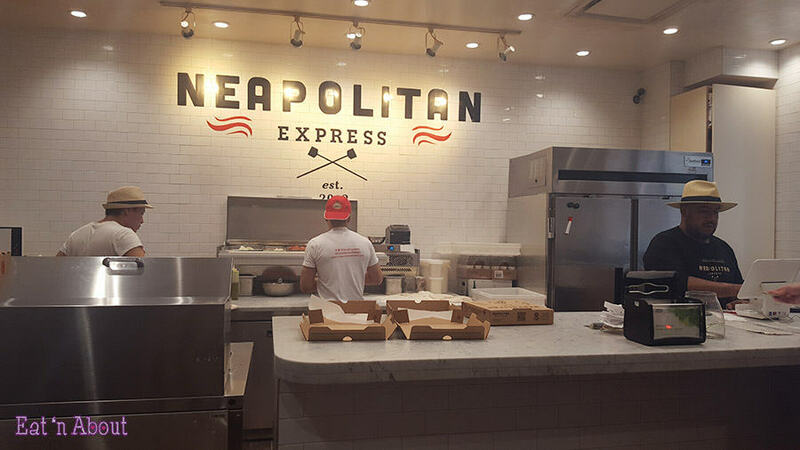 The first place we tried was Neapolitan Express in the Financial District right by the New York Stock Exchange. One Bite had given it an 8.1 (although it was the food truck version) which is a pretty good score so I was excited to start my New York pizza tasting with their offering. 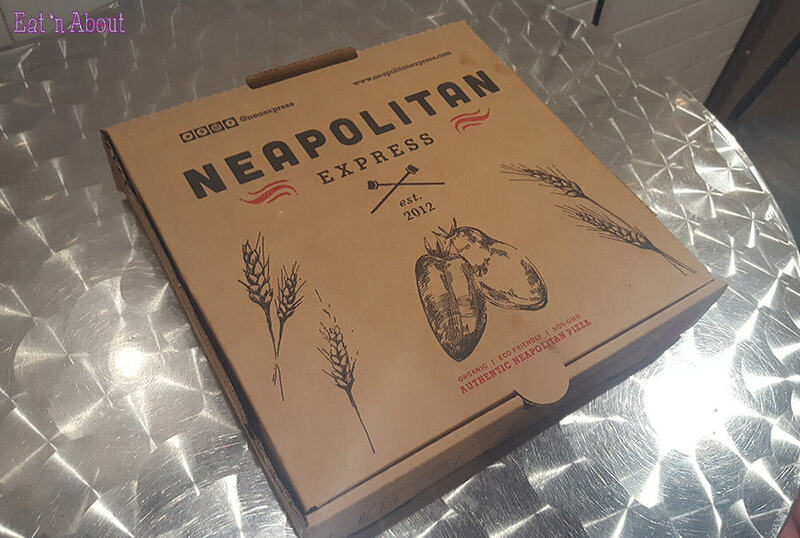 Neapolitan Express started out in 2013 as the world’s first Organic, Eco-friendly, Non-GMO food truck, built on the credo that “Fast Food should be Good Food”. 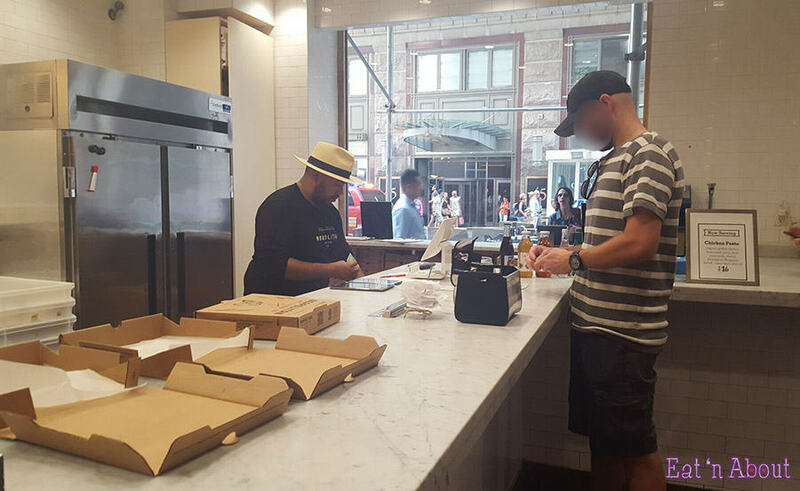 It quickly grew into 8 trucks and now 5 brick-and-mortar stores as well, offering 10 different individual-sized pies, sandwiches, and salads. We decided to split a classic Margherita pizza ($9) for a snack as we were wanting to try as many different restaurants in New York as we could rather than stuffing ourselves at just a couple. The shop was operated by 3 guys working in an almost assembly line fashion. One guy took my order and payment and passed the order to the 2nd guy who stretched out the dough and added the San Marzano tomato sauce, fresh mozzarella, basil, parmigiana, and olive oil. The 3rd guy was manning a pizza oven which was so hot it was cooking the small pizzas in under 2 minutes. Needless to say the whole process was very fast and in under about 5 minutes total we had a piping hot made-to-order Neapolitan style pizza ready to roast the roof of our mouths. As for taste it was pretty much as expected, which in this case was a good thing. It was just as hot, fresh and delicious as I anticipated. 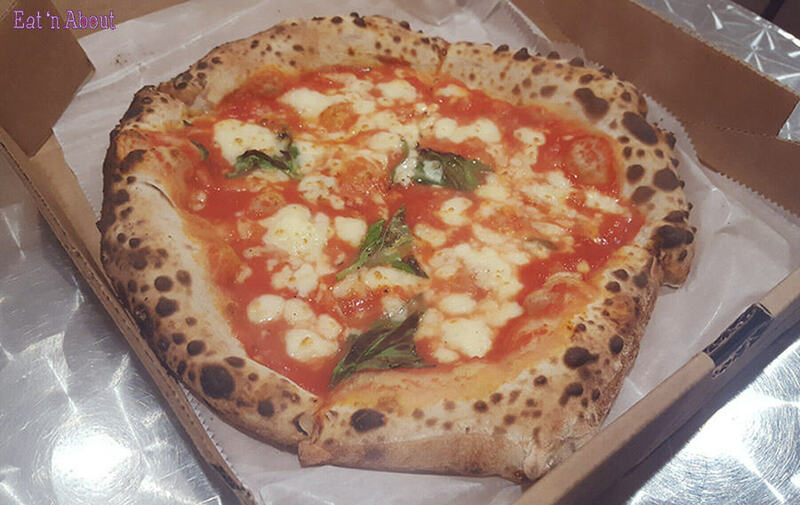 The dough had a good soft chew throughout the middle with crisp edges surrounding the classic trio of tomato sauce (slightly sweet), mozzarella (slightly stretchy), and basil (wish there was a bit more). It was the perfect snack we needed to keep us moving through our busy morning in NYC. I wouldn’t hesitate to visit Neapolitan Express again to try one of their other creations.